DreamWorks Animation and I have a long, complicated relationship. I’ve always been a dyed-in-the-wool Disney fan and an ardent supporter of Pixar, and I’ve generally felt that DreamWorks makes a somewhat second-rate product compared to Pixar. I enjoyed Shrek just like everyone else did, but after four sequels and a spin-off of diminishing returns I had had my enjoyment of the film pretty solidly beaten out of me. While Pixar was making Finding Nemo, The Incredibles, and Ratatouille, DreamWorks was making Shark Tale and Bee Movie. 2008‘s release of Kung Fu Panda was a minor revelation and, at the time, DreamWorks’ strongest film by far, but it still couldn’t compete with what Pixar was doing (2008 also saw the release of WALL•E). When Monsters vs. Aliens released in 2009, I was ready to throw in the towel and give up on DreamWorks Animation completely. Then, How To Train Your Dragon happened. As I said, I was ready to completely write DreamWorks Animation off, and I would have been content to never waste my time on another movie of theirs, but when I saw the trailer for How To Train Your Dragon I was instantly intrigued. It looked unlike any film previously released by the studio, and showed the potential of maybe being really good. Cut to March of 2010, and I find myself in a theater slowly falling in love with DreamWorks Animation’s first bonafide masterpiece. It was an absolutely transcendent film and a moment I’ll never forget. Since then, DreamWorks has had at least one legitimately good movie a year, movies like Kung Fu Panda 2 and Rise of the Guardians. Sure there were some stinkers in there, but it felt like they were potentially turning over a new leaf, and I was actually excited for their future. So that brings us to their most recent release: The Croods. 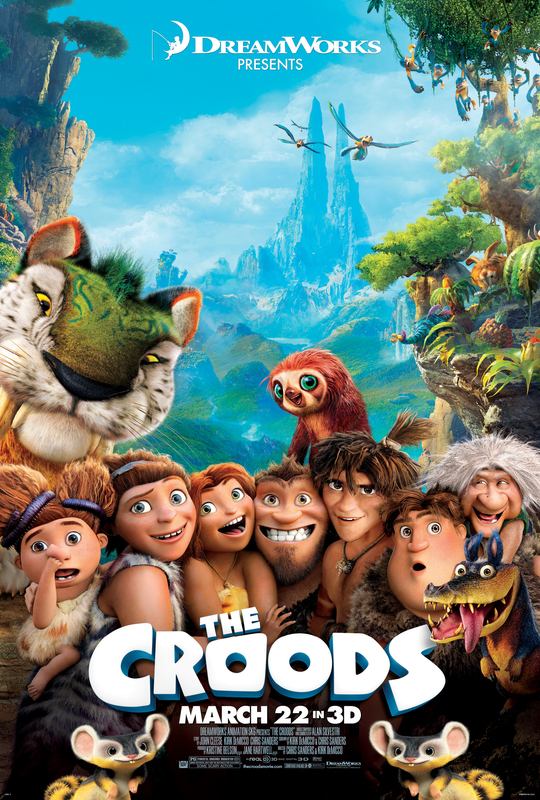 Overall, I felt as if The Croods was the weakest of DreamWorks recent set of good movies. I wouldn’t go so far as to call it bad; some of it is actually quite good, but it can’t match the quality of recent DreamWorks films like How To Train Your Dragon or even Kung Fu Panda 2. The films strongest aspect is its visuals. The movie is gorgeous to look at with not only strong animation and great production design, but it’s also very visually creative. There are a lot of smart touches brought into the look of the film, and little details that are worth admiration. The film is closer to How To Train Your Dragon than Lilo & Stitch in that it tends not to adopt Chris Sanders beautiful and unique visual style, but like Toothless in How To Train Your Dragon, there is a character or two that feel distinctly “Sanders.” Despite this, the film’s look is lovely, and it creates a world that is extremely satisfying to explore over the course of the movie. Unfortunately, the film’s story and characters never quite reach that level. It has just enough heart to still be satisfying, and obviously tries really hard to be an emotionally powerful experience, but for all it’s efforts, it is hampered by an over-reliance on silly slapstick and generic clichés of children’s animation. The movie feels like a game of tug-of-war, as if there are two sides of the film that are constantly at odds with each other. I’m not totally sure I want to do what I’m about to do as it’s very unfair and terribly mean, but as unfair as it is, this is my honest opinion in regards to the flaws of this film. This film can pretty solidly be summed up as a give-and-take of Chris Sanders vs. Kirk DeMicco. Chris Sanders was a story artist and writer for Walt Disney Feature Animation for many years before teaming up with fellow Disney artist Dean DeBlois to write and direct Lilo & Stitch (a movie that I personally adore despite the fact that Disney effectively ran it into the ground with ill-advised direct-to-DVD sequels). After that, Sanders began work on a film for Disney called American Dog about a TV-star dog who gets stranded in the desert and has to use his wits to get back home. Drama ensued at Disney; Sanders ended up departing and American Dog got re-worked into what eventually became the good, but not terribly memorable Bolt. Sanders and DeBlois eventually landed at DreamWorks where the two directed what is easily my favorite non-Pixar animated film of at least the last decade: the absolutely spectacular How To Train Your Dragon. Sanders’ work has always had a great deal of heart and creativity, with a decent amount of quirky irreverence thrown in for good measure, and I’ve loved just about everything he’s done (check out the fantastic web comic he did for a short while called Kiskaloo). Kirk DeMicco is…well, another story. He has writing credits on both Quest for Camelot, which I may have seen one time playing at the dentist, and Racing Stripes, a movie about a talking zebra played by Frankie Muniz that I think I watched at some point but remember exactly nothing about. His first directing credit was on the film Space Chimps, which he also wrote. In preparation for this review, and against my better judgement, I watched Space Chimps for the first time this week. It was kind of incredible how absolutely everything in that movie could manage to fail on a fundamental level. Really, I tried to find even one single thing in the movie that I could say was even okay, but there was nothing. It’s not the worst movie I’ve ever seen in my life, but it definitely makes the list. It was so thoroughly inept I had to question if anyone who worked on the film had ever even seen a movie before, let alone worked on one. So given that history, I can only assume the pairing of these two directors is where many of the film’s problems lie. As I said, this is terribly unfair of me. I don’t know either director personally, and it’s entirely possible that all of Kirk DeMicco’s previous efforts were kneecapped by nasty studio politics, bad teams, or other complications. It’s entirely possible, but I find it extremely unlikely. As I said, all I can do is judge based on his previous works, and his previous works lead me to believe he is a terrible hack who makes inept movies for babies. Where Sanders’ previous films have had wonderful amounts of creativity and heart, Space Chimps was about as cold, cynical, and incompetent as they come. It was filled with the most trite, bottom of the barrel material, and that kind of stuff creeps in at certain points during The Croods and undermines anything the film has going for it. As I said, the film is extremely visually creative, and has a decent amount of heart, both of which are staples of Sanders’ work, but it is also filled with cheap gags and an abundance of bored slapstick, the same kind of issues (among many, many more) that plagued Space Chimps. This is especially problematic around the middle of the film. The film runs into the classic problem of losing a bit steam during this point, and with a lack of narrative pull to keep the story moving forward at a steady pace, the empty spaces are filled with dumb crap that you’ve seen in a hundred other kids’ movies. Fortunately, though, there are enough elements of creativity and heart to carry you through to an ending that helps in a big way to redeem the film. As I mentioned, the visuals and the creativity of the film are very much enjoyable, and the characters of Eep and Guy especially are fairly well executed and legitimately worth caring about. While we’re on the subject of characters, let’s take a second to talk about the voice performances. DreamWorks tends to be more into celebrity voice casting than Disney and Pixar typically are, and that’s fine so long as the celebrity voice feels like a natural fit for the character. In The Croods Emma Stone and Ryan Reynolds both do a great job with their characters, in fact if I hadn’t known ahead of time I probably wouldn’t have even pegged Reynolds as the voice of Guy. Grug, on the other hand, is more problematic. There was a severe dissonance between the character of Grug that existed on screen and the voice of Nicholas Cage coming out of the speakers; the two elements never felt like they meshed. This is a case where there was probably someone much better suited to the role, but because they went with a celebrity voice they missed the opportunity to make that character work the way he needed to. I would not call The Croods a bad movie by any means. There are a lot of things I really liked about the film. Several of the characters worked well, there was a good score from Alan Silvestri, and, of course, there’s the element I keep coming back to of a really strong visual style. It also had an ending that was satisfying and far more heartfelt (and Sanders-esque) than most of the rest of the film, so it at least ends on a high note. Unfortunately, there’s enough pandering, low-level, tripe to hold it back from greatness. There’s just enough Sanders in here to save it from being bad and to make this film worth a watch, but there’s also just enough DeMicco to prevent the film from being as great as it might have been otherwise. I’m not sure whether this was something they decided for themselves or if it was something DreamWorks encouraged, but I really miss the pairing of Chris Sanders with Dean DeBlois. DeBlois is currently working on How To Train Your Dragon 2 without Sanders, but I very much hope that the two of them get back together and begin to collaborate again. They have done really great work together in the past and I would love to see what else they can do rather than have them paired with hack filmmakers who end up compromising the quality of their work. Yeah, I’m a bit worried about How To Train Your Dragon 2. I very much want it to be good, but it feels like a bad idea splitting up Sanders and DeBlois. And yeah, Avatar is an apt comparison, although, the difference, I feel, is that this doesn’t take itself as seriously as Avatar did, so it’s a bit less annoying in that regard. Thanks for the kind words, I’ll have to check out your site. Haha sounds good! thats good that it doesnt take itself seriously. So the main comparison critics were giving between the croods and avatar was because of the story?